Birding Is Fun! : Shrike Attack! Sometimes the most memorable birding moments happen when you aren't even birding. That's what happened to me this past week when I was in my backyard enduring another bitterly cold afternoon while taking my dogs outside. The yard bird action has been uneventful lately with the usual winter suspects all stopping by for their daily sustenance. I continue to feed the hordes of House Sparrows and Dark-eyed Juncos for the chance of seeing my pairs of Northern Cardinals, Eurasian Collared Doves, and lone American Tree Sparrow. The noise and movement of the abundant sparrows and juncos is constant. But not today. Instead the backyard was strangely quiet. The only birds I could find were a pair of Black-capped Chickadees flitting about in my maple tree. Then I saw a bigger bird fly up to the very top of the maple. I figured it was a Blue Jay or one of my doves. But then I looked closer and could tell from the posture and position on the top of the tree that it was a Northern Shrike! I quickly ran inside to grab my camera. Northern Shrike in the yard! Interestingly this shrike was not bothered by my presence as I walked all around underneath it taking pictures. This was curious because I have always found shrikes to be very skiddish. Another curious behavior I observed was that it sounded like the shrike was imitating bird noises/songs. Since shrikes are predators, I wondered if this was a ploy to lure in unsuspecting prey. After getting a couple usable photos I decided my bare fingers had suffered enough punishment in the sub-zero temps, so I headed inside. Later on as I looked out my kitchen window, I saw a bird fly into my cedars. I was looking west toward the setting sun, and the bird was deep in the cedars so I couldn't tell what it was. But it was thrashing around like crazy. Could it be? Was this the shrike working on a stashed kill? I've read that they impale their prey on sharp stick only to return later to feed on it. I used the zoom on my camera to see if I could get a clue as to what was going on. 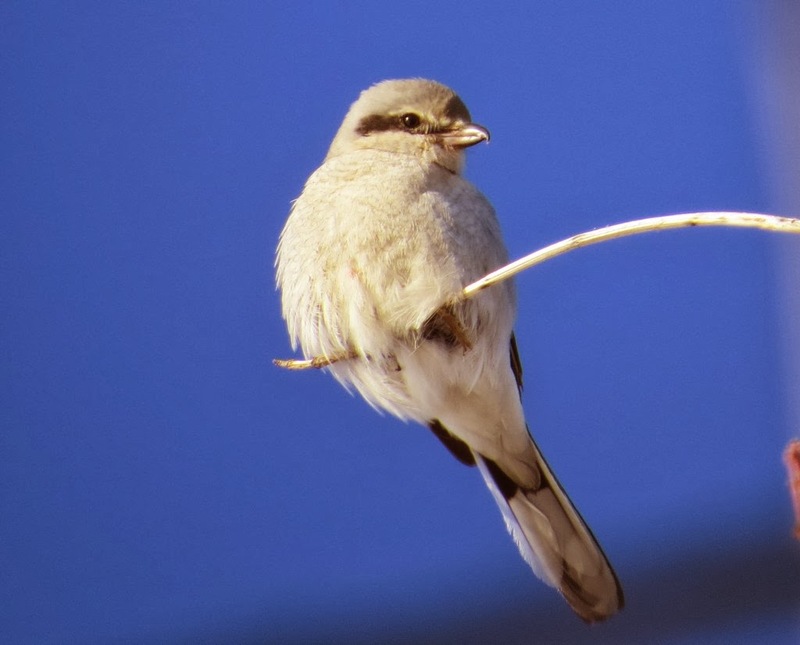 Is it the Northern Shrike? Then the bird moved, and I got this image which confirmed my suspicion! Now I was excited. I raced out to this spot and slogged my way through over a foot of snow to check out what the shrike was working on. Meanwhile the shrike did not fly very far away. After a little bit of searching I found what I was looking for - an impaled House Sparrow! This was a cool find. It was no wonder why this shrike didn't want to leave the area when I was in the yard. I was interrupting its dinner. Several times I observed the shrike flush from his meal only to go a short distance away and return soon afterward. Seeing a Northern Shrike is always a good find. Finding one in your yard is real treat. Witnessing a Northern Shrike eat its meal in textbook fashion was an unforgettable birding moment. Now if only it will stick around to help thin out my enormous House Sparrow flock. Josh Wallestad writes about his birding adventures with his seven-year-old son at A Boy Who Cried Heron and has a website dedicated to helping birders find birds called Birding Across America. A great backyard visitor and interesting observations. Excellent photos, though I feel sorry for the sparrow. Wow what an experience, very good narrative. Thanks for sharing. Quite a find, Josh! 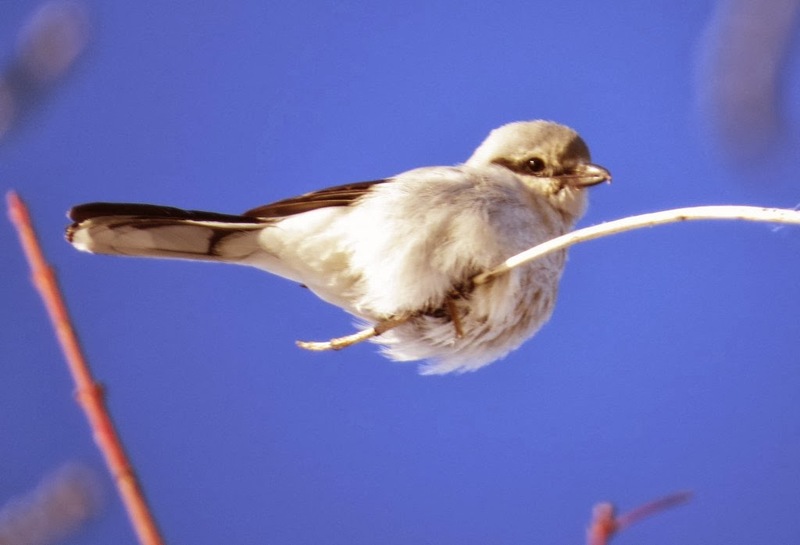 How interesting to see the shrike with impaled prey behavior. Wonderful post! Great backyard surprise!